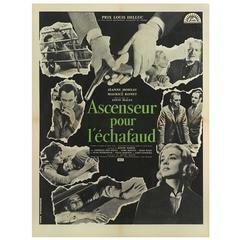 This original Ascenseur pour l'Echafaud Polish movie poster was designed by Jan Lenica in 1958. Jan Lenica (1928-2001) was a Polish graphic designer and cartoonist. A graduate of the Architecture Department of Warsaw Polytechnic, Lenica became a poster illustrator and a collaborator on the early animation films of Walerian Borowczyk. From 1963-1986 he lived and worked in France, while from 1987 he lived and worked in Berlin. He was a professor of graphic, poster, animated cartoon for many years. Original French Movie poster Louis Malle's 1958 French new wave film. The poster is designed by Jacques Fourastie.